Before we get to the lens itself, the packaging has a couple of errors on it. The lens is described as a “Standard Fixed Focus Lens” but of course what is actually meant is that it is a Standard Prime Lens, or a Standard Fixed Focal Length Lens if we prefer. It certainly does focus. The second small error is that the filter thread size is 52mm, not 50mm as stated in the specifications and on the box. 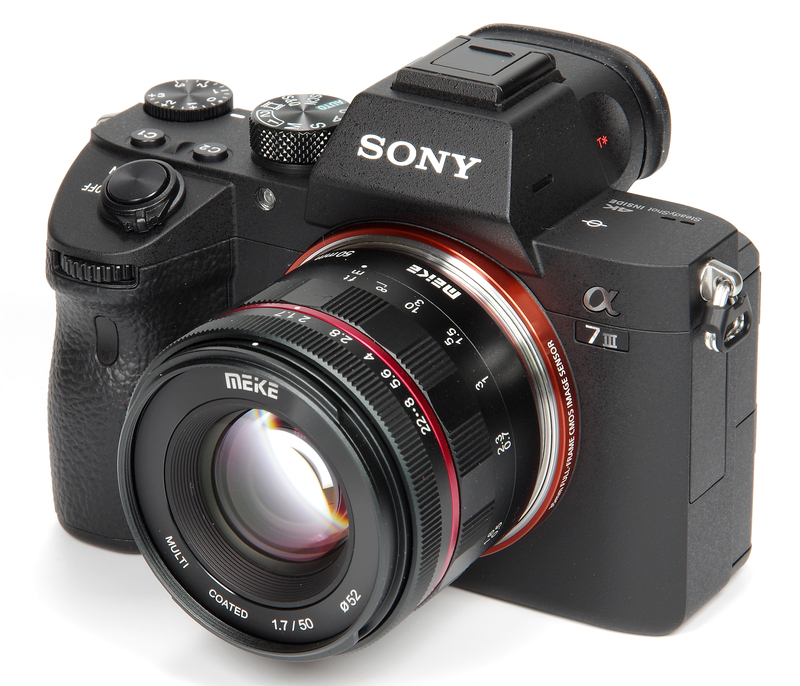 For this review, we are looking at the Sony FE mount version, coupled with the Sony Alpha A7 Mark III 24MP camera body. Other mounts available are Canon EF-M, Nikon 1, Fuji X and MFT. Starting with fitting the lens to the camera, the fit on this sample is very, very tight. Having said that, it proved to be much easier on another Sony body, so it may well be a case of the tolerances being at opposite ends of the scale and not matching as smoothly as one would hope. However, fit it does and there is no play once clicked into place. Our tour of the lens starts with the petal lens hood, which bayonets cleanly into place. A petal hood seems odd for a 50mm lens, but it is just a reflection of the style of the modern kit lens, carried from the ubiquitous zooms and perfectly efficient. As previously mentioned, there is a standard 52mm filter thread. 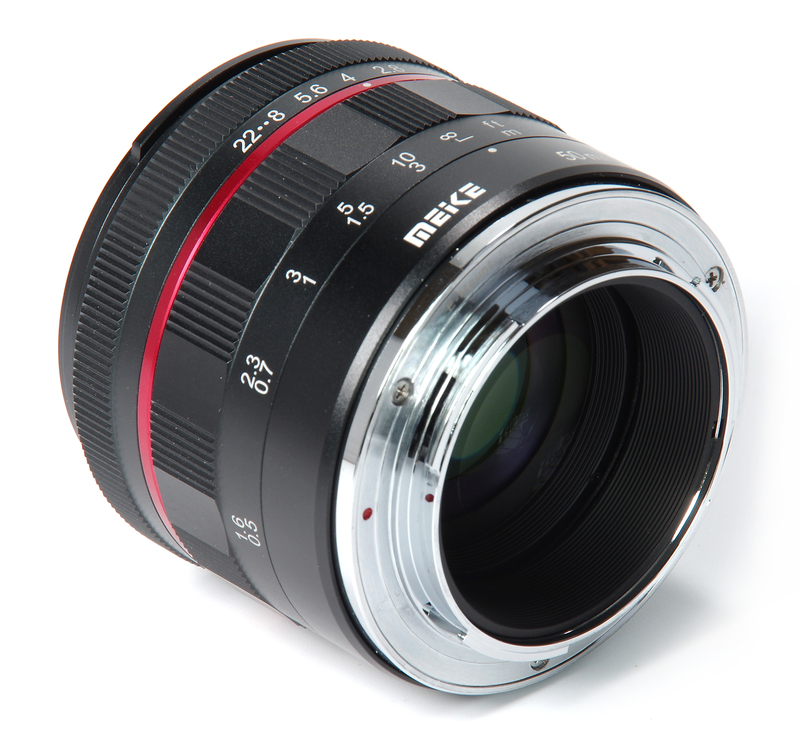 The aperture ring is clickless, an advantage for those who shoot movies, and it is very smooth in operation. The spacing is not uniform and f/11 and f/16 are reduced to dots on the ring as a consequence. There is no automatic diaphragm, so the aperture set remains set throughout. 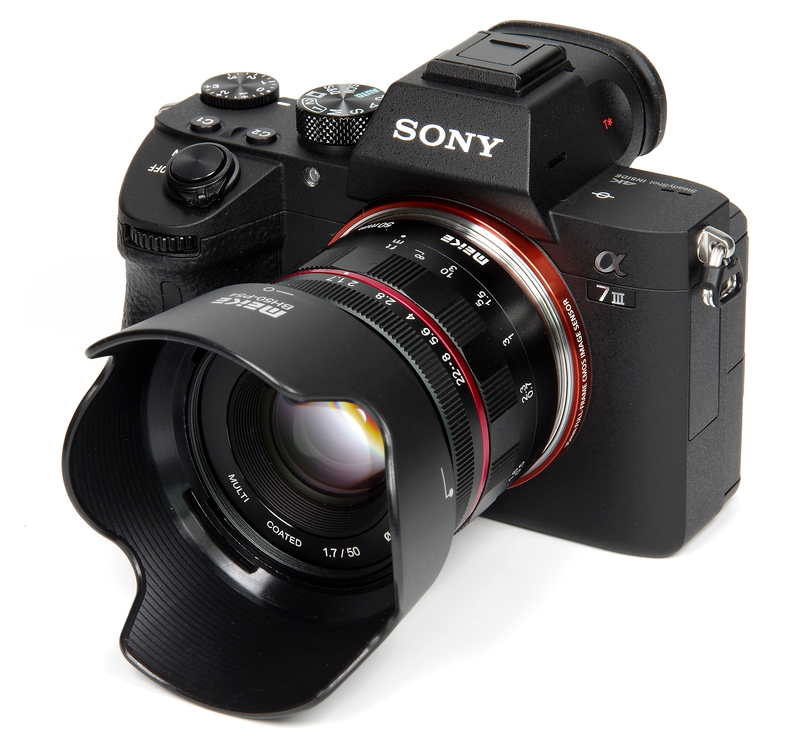 Focusing might usefully be done at full aperture and the various focusing aids in the Sony camera bodies help to ensure this is accurate. The aperture has 12 blades, potentially improving the bokeh of the lens. The focusing ring is quite stiff in operation, but with use showing signs of smoothing out. Focusing goes beyond infinity and down to 0.5m, just under 1.6 feet, a maximum magnification of 0.11x, which is fairly close but not exceptionally so. Finally, some engraving reminds us that this is a Meike 50mm f/1.7 lens, which we already know, and a trick is missed in that there is room here for a depth of field scale instead. With a manual focus lens, such a scale can be very useful and it seems a pity to leave it out. Lens construction is 6 elements in 5 groups, with nano multicoating. The whole lens weighs in at 320g, looks to be well made and has the added benefit of being dust and moisture resistant. Operation is naturally slower than using an AF lens, but the considered approach can often lead to improved images. The aperture ring moves in the Nikon/Pentax direction and the focusing ring moves in the Canon direction. This becomes more significant ergonomically with a manual focus lens, and perhaps choosing one style or the other might be helpful, rather than mixing the two. Apart from that, the lens operates flawlessly.